How can you bring a little pergola romance to your garden? Gardens, by their very nature, bring about feelings of romance: beautiful fragrant flowers, intimate spaces, relaxation and escape. They transport us to another place where we can be at one with nature; satisfying both our senses and our soul. Pergola romance, however, can just be a place to lose ourselves in our own thoughts and dream a little. Creating an atmosphere is probably the most important thing for pergola romance, with warmth, enclosure, peace, comfort and things that satisfy the senses. If you can include all of these things, you are on to a winner! Think of your ideal vision of romance in your garden. What does it look like, smell like, what can your hear and feel? This will give you a good starting point. Do you think of a fragrant rose-covered pergola walkway surrounded by beautiful perennial borders, or a cosy little arbour hidden in the shrubbery! In any case, usually, a romantic space is enclosed or sectioned off. 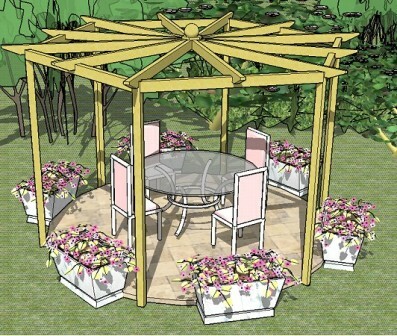 This space can be created using a pergola, a seated or swinging arbour (I must admit I do love a swinging arbour! ), a gazebo, trellis panels and planters, paving, decking or even decorative gravel. The area can be as big or small as you wish it to be. With so many choices of hard landscaping and accessories on offer today, there is sure to be something that will bring that much needed romance into your garden. And it doesn't need to be complicated or expensive: a well-placed seating area here; a few colourful planters there, and you have created your own cosy little space. A pergola or seated arbour in either wood or metal can be an ideal structure to make your space intimate. Metal arbours can be crafted into very intricate designs. 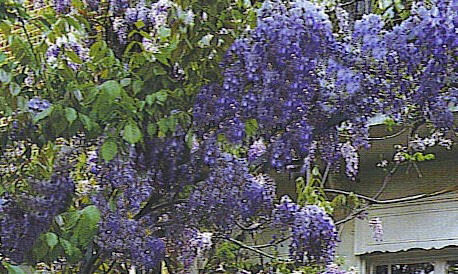 And the bonus is that you can have wonderful climbing plants very close by so that you are able to see and smell them from within the pergola itself. Perfect for that pergola romance you're after. Consider how you will use the space: for dining, relaxing or both. Choose your furniture and accessories to give maximum impact to your overall plan. Draw a simple diagram and list the things that you would like to see there, starting with the basic hard landscaping: a patio and pergola combination; a deck and pergola; decorative gravel, trellis and planters; and then think about the accessories you might include: colourful throws, outdoor beanbags, hanging chairs, garden lights, heaters, loungers and dining furniture, to name but a few. The accessories and planting are often the things that bring romance to the area. Simple, minimalistic and chic, with the pergola, garden furniture and accessories doing the talking. 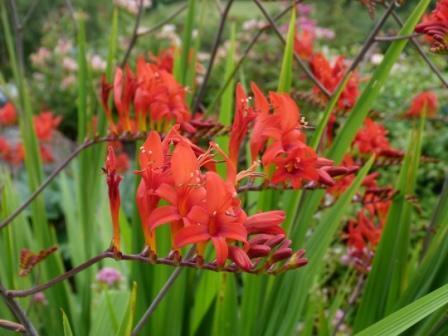 Use strong, simple architectural planting in large pots, or in the ground, to add interesting form and colour. 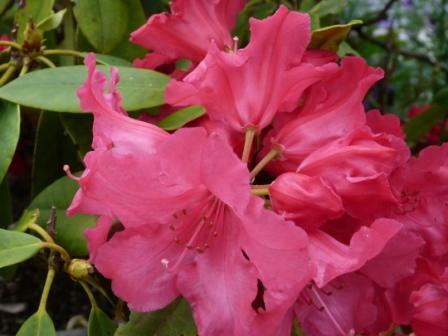 A beautiful, deep pink, evergreen rhododendron. Country cottage, with the planting taking centre stage. To achieve this look, use mainly perennial plants with some rockery, ground cover and, of course, wonderful climbing plants. 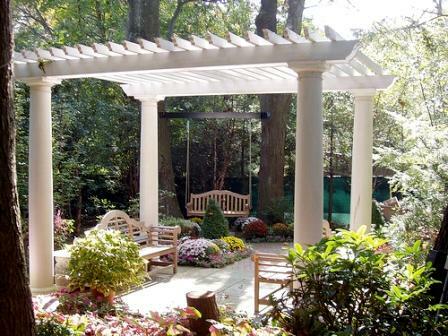 Take a look at some other pergola ideas for garden design. These will help you to think about where to place your garden structures for the best effect. 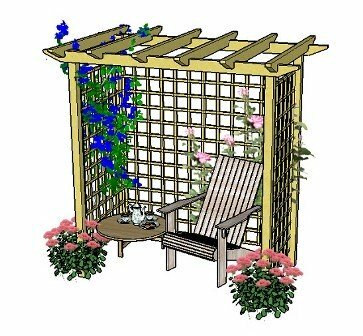 Have a look at some examples of pergola plans, pergola kits and garden garden furniture, to get more ideas for a bit of pergola romance. ...and this is an Asian style, dragon pergola with wonderful curved rafters. Notice the simple, yet bold, architectural planting, which compliments and enhances the oriental style. Ideal for a little pergola romance tete-a-tete! This pergola looks really good standing with its corner posts against a wall, too. Very romantic and unusual. The hexagonal pergola is also very intimate, being inward facing. There is so much you can do with this pergola to make it into a wonderful garden feature. An attached lean-to pergola has the potential for adding garden furniture and accessories that will make this a really special place. 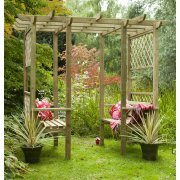 And this arbour is so cosy, it's possible to feel the romance whether you are on your own or with that special someone! 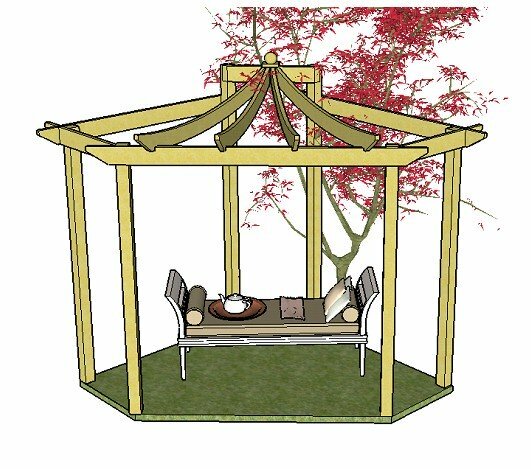 The advantage of this arbour is that it is extremely easy to build! It is possible to create a wonderful area for very little, using a basic seating area and plants. It is preferable to get the basic structure sorted first. The accessories can come later when you happen upon them. Most pergola romance is created using attractive and interesting plants and accessories. These really do make a tremendous difference! Keep your eye out for plants, cushions, throws, candles, chimes and any other accessories when you are wandering around garden centres, markets and diy stores. These can be added as you go along. I often list voucher codes and offers here. It's possible to make some great savings this way on a whole range of garden structures and accessories. Keep an eye out on my blog page too, as I say when I've updated the offers page with new bargains. Finding garden accessories to furnish your romantic outdoor space can be great fun. These don't need to be expensive! Garden Furniture: wooden, wrought iron, textoline, plastic, beanbags, outdoor beanbags, cushions, hammocks, hanging chairs, parasols. Garden Heating: patio heaters, chimineas and fire pits. Garden Lighting: solar, low voltage, candles. Hot Tubs: static and portable. 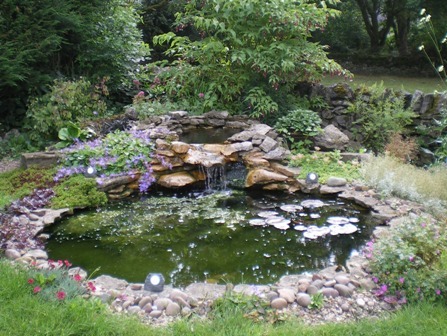 Just the sound of running water gives a whole new dimension to the romance of a garden. Have a view like this from under your pergola, seated arbour, gazebo or summer house. 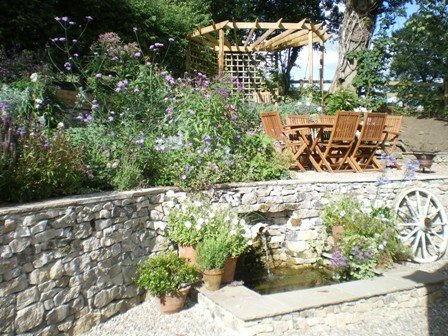 Or put your water feature under your pergola, where it acts as a focal point in the garden. 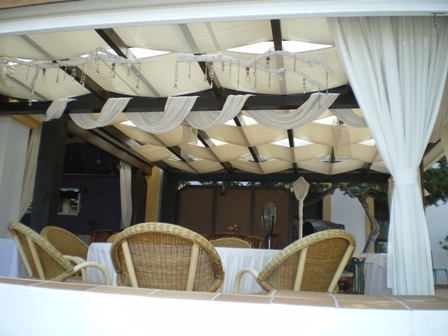 The pergola itself can be any style: square, circular, Asian or traditional. Place it carefully, where it will have maximum effect. Keep it simple or go all out for the WOW! factor. If you want to include an accessory or feature that is a bit out of the ordinary in most gardens, you might go for something like outdoor beanbags, a hammock or hanging chair, a chiminea or the crème de la crème...a hot tub! None of these are necessary - but what does necessary have to do with romance?! Plan, explore ideas, build and enjoy! !